The current world population is 7.6 billion people and it is predicted to reach 9.7 billion people in 2050. The number shows that agricultural improvements are necessary to prepare for global food needs. Indeed, agricultural industries have to adapt to decrease the impacts of climate change such as global warming. 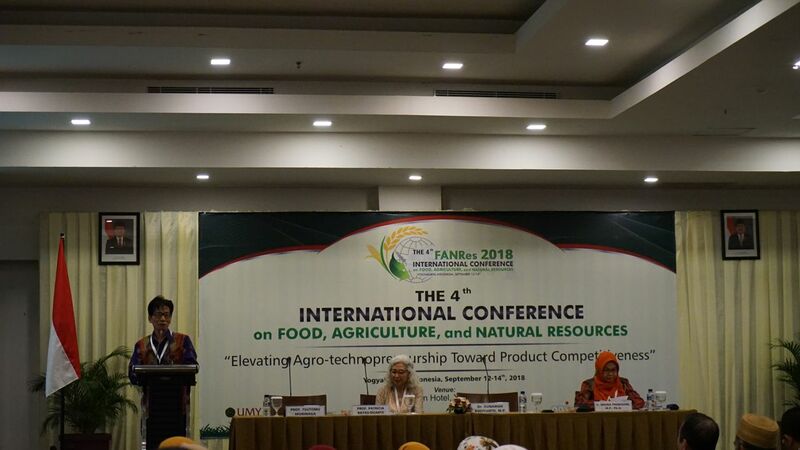 The issues of food needs and agriculture were discussed at the 4th International Conference on Food, Agriculture, and Natural Resources (FANRes) organized by Universitas Muhmmaidyah Yogyakarta (UMY) at Cavinton Hotel, D.I. Yogyakarta on Wednesday and Thursday (12-13/9). Rector of UMY Dr. Ir. Gunawan Budiyanto, M.P., who is also a lecturer at Faculty of Agriculture of UMY, stated that regional and global climate change causes extreme global weather. “The extreme weather induces the raising of sea water which can damage agricultural land and reduce production of agricultural industries,” he declared. Gunawan conveyed that agricultural industry improvisations are essential to adapting to the climate change and diminish the impacts. “We have to apply agricultural techniques which support agro-ecosystem productivity. For instance, we can improve techniques of land management; do not carry out excessive land management such as such as burning land and using synthetic fertilizers; increase the implementation of organic materials; escalate soil carbon; and reforest land,” he mentioned. Meanwhile, a keynote speaker from Oklahoma State University (OSU) Prof. Patricia Rayas-Duarte asserted that to cope with issues of food we have to regard food systems besides improvements of production aspects. “In agriculture, food systems possess production aspects, distribution aspects, and food security. The last two aspects should parts of ‘global business’ since agricultural research and development is now only centered in developed countries. Thus, other countries should contribute to other aspects,” she contended. “Sustainability is the key of our food system improvement and to achieve it we have to improvise. We should utilize technology to produce, distribute, and reserve our foodstuffs more efficiently,” ended Prof. Patricia.